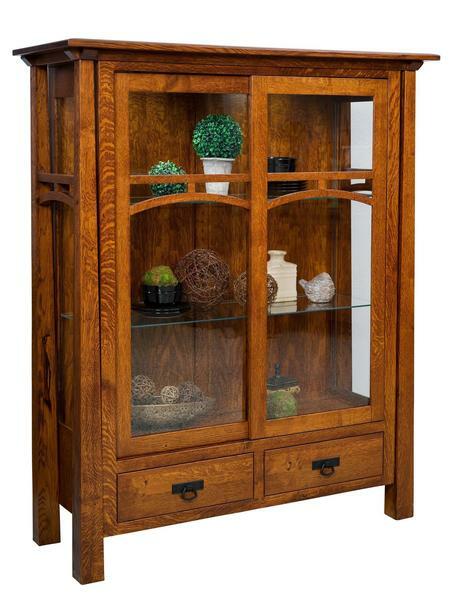 The Amish Artesa Curio Cabinet is warm and welcoming in your choice of solid wood. With decorative arches on the front doors as well as the sides, the craftsmanship of this curio cabinet is evident. Store candles in the master bathroom, favorite collections in the living room, or keepsakes in the den in a wood curio that will last and look lovely for ages. The Artesa has sliding doors and interior lighting and offers two bottom drawers for additional storage. Measures 54" wide, 19" deep and 64" high with adjustable shelving and plate grooves. Choose two or three shelves to best house your collectibles. Amish craftsmen with many years of experience handcraft your new curio with care and precision. Please email or call us with any questions. Thank you for shopping with DutchCrafters.